I have long loved sushi. For years I was hesitant to it’s raw and texturizing appeals but once I tried it, I was hooked for life! I was on NBC’s Celebrity Cooking Showdown during my Miss USA helm and on the show, my celeb chef, Cat Cora, taught me how to make sushi. I of course, was completely grossed out. Her enlisted help from famed chef Morimoto didn’t do much to change that until I tasted the first roll I had made. Immediately I was in spicy tuna heaven. Flash forward to my new gluten free life where I can still enjoy my fav dish, but with a few slight modifications. First things first: become a creature of habit. When you find a true gluten free friendly restaurant, dish or recipe, stick with it. You’ll always be safe and never sorry. Ruby Foos in NYC (49th & Broadway) has become a safe haven for me when I’m in the city. Not only do they have an extensive GF menu, but they go above and beyond to keep cross contamination extinct. 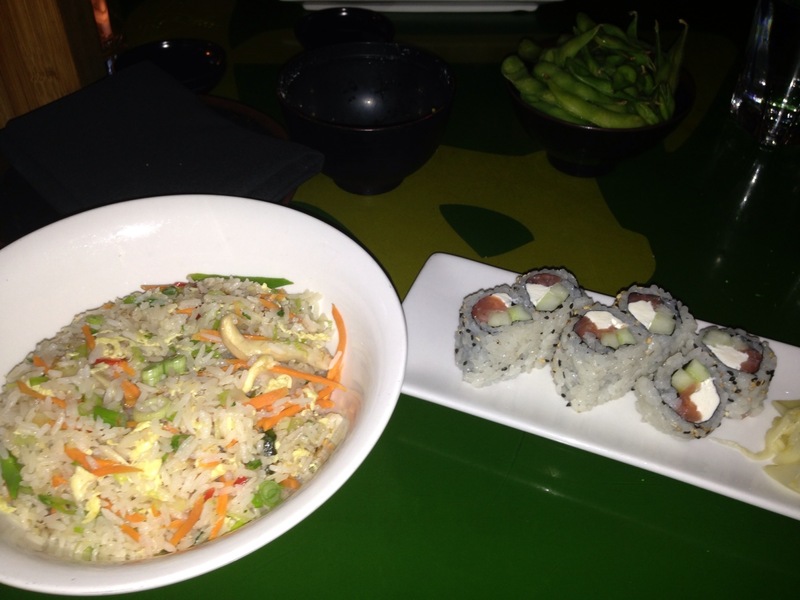 I always order their New Yorker roll and the veggie fried rice. It’s insanely good but like all things GF it needs to be ordered in a special way. 1. Make sure to tell the server you are GF. 2. Make sure there is NO tobiko on your sushi roll. Tobiko (fish eggs) contain wheat in them. Not sure why, but there ya go! 3. Ask for GF soy sauce. Yes, there’s wheat in that too! They keep it plentifully on hand. Sushi is limiting for all of us GF’s out there so be weary of sauces, panko, and tobiko. Stick to your new classics and sushi it up baby! This entry was posted in Uncategorized and tagged Cat Cora, Celebrity Cooking Showdown, cream cheese, dining out, fish eggs, fried rice, Gluten free, gluten free diet, Japanese food, Miss USA, Morimoto, NBC, New Yorker, NYC, restaurant, Ruby Foos, salmon, San J, soy sauce, spicy tuna roll, Sushi, tamari, tobiko, vegetable on May 18, 2013 by Miss Gluten Free.